Klein Sun Gallery is pleased to announce two highly-anticipated exhibitions this summer, “Borrowing an Easterly Wind” and “Live like an Astronaut” from August 13 through September 5, 2015. The solo shows feature rising female artists Geng Xue and Ying Zhu. 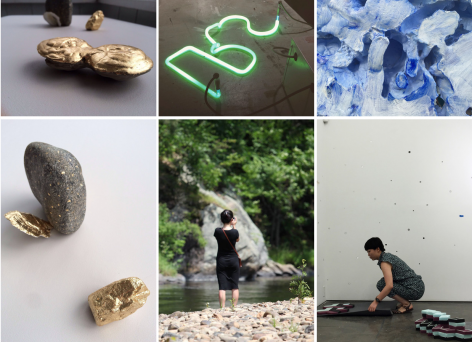 After working and creating for a month at the Klein Sun Residency at Millers Falls Art Bridge in rural Massachusetts, the two Chinese artists present multimedia installations across our North and South gallery spaces, unexpectedly converging at various points of their separate bodies of work. A protégé of the renowned artist Xu Bing, Geng Xue hails from Beijing, a city which dictates much of her interest in Chinese folklore and her recontextualization of traditional ceramic and porcelain. 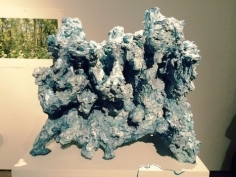 Upon arrival to our residency at Millers Falls in early July, Geng continued her exploration of clay in tandem with her interest in ancient Chinese philosophy, namely the Daoist writings of Zhuangzi. As the residency progressed, she began to draw parallels between the environment around her and the ‘pipes’ or pathways of life described in Zhuangzi’s texts. The resulting work is a spiritual response to the ‘pipes’ found across China and America through an installation in which Geng carves out her own gaps and holes in both two dimensional and three dimensional work. The multimedia artist Ying Zhu also joins the residency. Having studied in both her native China and the U.S., she is primarily preoccupied with the hybridization of cultures and the human condition. She examines Western culture through distinctly Eastern eyes, creating immersive installations that are at once personal and also are gateways to society. At Millers Falls, she became interested in the materials around her; like a forager, she collected wood and stone and was drawn to the stretched dimensions of time and space that allowed for creative meditation. Exposing details often overlooked by people rushing through life, Zhu creates an installation within the gallery that overturns conventional sight and touch experiences. The artists documented their processes through visual and written means throughout the residency, the results of which can be found on Chinese contemporary art blog The Analect (the-analect.com). Ying Zhu was born in Lanzhou, China in 1979 and graduated with an MFA from the Studio Art department of University of Nebraska, Lincoln in 2010. 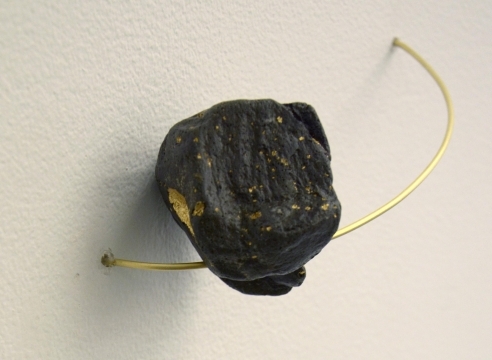 Her work has been exhibited in solo exhibitions including “Crumbs of Tenderness,” Lied Gallery, Creighton University, Omaha, NE (2014); “Return As Departure,” Lux Center for the Arts, Lincoln, NE (2014); “Every Cloud Has A Silver Lining,” Union for Contemporary Art, Omaha, NE (2014) and “Please Watch Your Step,” Museum of Nebraska Art, Omaha, NE (2013). 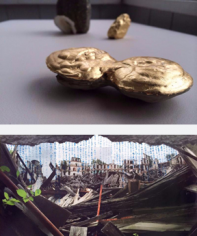 Group exhibitions include: “Magical Thinking,” Roots Division, San Francisco, CA (2014); “Process,” Antenna Gallery, New Orleans, LA (2013); III Moscow Young Art Biennale, Moscow, Russia (2012); “Mind the Gap,” Neukolln Art Festival Nacht Und Nebel, Berlin, Germany (2011); “Crossing 2009,” Harwood Art Center, Alberquerque, NM (2009) and “Obstructed View,” Wood Halls Gallery, University of Alabama-Tuscaloosa, AL (2008). She is the recipient of the NAC Distinguished Artist Grant (2013) and Best Emerging Artist and Best New Media Artist at Omaha Entertainment and Arts Awards (2012). "Borrowing an Easterly Wind" and "Live Like an Astronaut" (Klein Sun Gallery, 2015) is part of the 'Art' section of Wall Street International. Art of the Times writes about Geng Xue and Ying Zhu's exhibition (Klein Sun Gallery, 2015). Alison Martin from the Examiner reviews Geng Xue, "Borrowing An Easterly Wind" and Ying Zhu, "Live Like an Astronaut" exhibition (Klein Sun Gallery, 2015). SinoVision Journal reporter Lani Nelson brings you the story of Geng Xue and Ying Zhu's opening reception (Klein Sun Gallery, 2015).